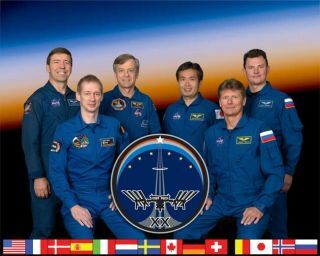 From the right (front row) are cosmonaut Gennady Padalka, Expedition 19/20 commander; and European Space Agency astronaut Frank De Winne, Expedition 20 flight engineer and Expedition 21 commander. From the left (back row) are NASA astronaut Michael Barratt, Expedition 19/20 flight engineer; Canadian Space Agency astronaut Robert Thirsk, Expedition 20/21 flight engineer; Japan Aerospace Exploration Agency (JAXA) astronaut Koichi Wakata, 18/19/20 flight engineer; and cosmonaut Roman Romanenko, Expedition 20/21 flight engineer. An American astronaut and a Russian cosmonaut will step outsidethe International Space Station early Friday to prepare the orbital lab for anew module slated to arrive later this year. Russian station commander Gennady Padalka and NASA flightengineer MichaelBarratt are due to begin the planned 5 1/2-hour spacewalk at 2:45 a.m. EDT(0645 GMT). Thespacewalkers will attach new antennas to the station's Pirs dockingcompartment to prepare for the arrival of the Mini-Research Module 2, a newcompartment and docking port that will be launchedtoward the station this fall. Padalka and Barratt will complete the installation during asecond spacewalk June 10. "These [spacewalks] are part of a bigger preparationscheme in getting ready for the launch and docking of MRM2, which is the MiniResearch Module, scheduled to launch and dock to ISS in November of thisyear," said David Korth, Expedition 20 spacewalk flight director, during aThursday briefing. Barratt, who will don a Russian spacesuit with blue stripes,will be making his first ever spacewalk. Padalka, a veteran spacewalker, willbe wearing a suit with red stripes to differentiate him. The spaceflyers will betesting out a new spacesuit model ? the Russian Orlan MK. ?The new suitsinclude slight upgrades from previous versions, such as a different electroniccontrol system and more adjustability in the leg, torso and arm regions forcomfort, mission managers said. The two spaceflyers arrived at the International Space Station(ISS) in March on a Russian Soyuz rocket to begin a six-month tour of duty.They are currently serving alongside Japanese astronaut Koichi Wakata, cosmonautRoman Romanenko, Belgian astronaut Frank De Winne, and Canadian spaceflyer RobertThirsk. The latter three arrivedlast week on a Russian Soyuz flight; collectively, the spaceflyers make upthe station's first six-person crew (doubled from the previous crew size ofthree). "They had a good weekend together, got a chance to restand get used to more people onboard," said Courtenay McMillan, NASA?s leadflight director for the station?s current Expedition 20 mission. "They'reall very excited to be onboard and in very good spirits." During tomorrow's spacewalk Wakata will assist Padalka andBarratt from inside the station. ?The antenna set they will install, called theKurs antenna, will serve as a navigational beacon to guide the new module intoport at the space station. Once attached, the Mini Research Module will serveas a new airlock for Russian spacewalks, and will allow spacewalkers to placescientific experiments outside the station if they need to be exposed to thespace environment. SPACE.com will provide live coverage of tomorrow'sspacewalk by reporter Clara Moskowitz in New York. Click here for livespacewalk coverage, mission updates and SPACE.com's live NASA TV videofeed. Friday's spacewalk coverage will begin at 2:15 a.m. EDT. New Video - Recycled Space Station Urine, Drink Up!